Almost everyone has a mole somewhere in our body. Some skin moles are raised above the skin surface, others are flat. They vary in texture, color, and size. It is true that some moles are really sensitive than others and some might also become irritating. So what should you do if you have an itchy mole? The worst case scenario of having a mole is if it were to develop into skin cancer. This is not very common, but some people are more susceptible to develop cancer. These factors include having light-colored skin, have had a lot of exposure to the sun, and have a genetic disposition to melanoma. 1 Why You Should not Ignore Itchy Mole? 2.1 Does the Mole Look Asymmetric (Different on Both Sides)? 2.2 Does the Mole have an Irregular Width or Diameter? 3.3.2 Was this article helpful? Why You Should not Ignore Itchy Mole? Even normal moles can be itchy occasionally. Be certain that you recognize how often the itching occurs and how irritated it becomes. This might mean that your mole is just reacting to a normal dryness or irritation, etc. But be aware if you have been having excessive itching for a long time period. This might be a clue to look for other possible signs of melanoma or skin cancer. Does the Mole Look Asymmetric (Different on Both Sides)? Moles that have different hues and shades within the borders might need to be analyzed by an expert. Normal spots within the mole are just in one color. Darkening or lightening of the mole can occur, but it is usually very subtle. Does the Mole have an Irregular Width or Diameter? A Mole that is larger than a pencil eraser which is usually between 6mm or 0.25 inch needs to be consulted by a doctor. Any other irregularities, like as jagged borders, irregular colors and asymmetric features are grounds for clinical examination. The good news is that it’s easy to identify skin cancer easily. The key is to notice the signs are early as possible. If itching, flaking or bleeding is the features of your mole, it is a sign that you must have a look at so they can tell you if it’s time to take a biopsy of the affected area. With the modernization of technology, there are a wide range of option that you can consider for removing the moles that itch without any pain. For immediate effects, surgical methods are suggested for raised itchy moles which are expensive but safe. 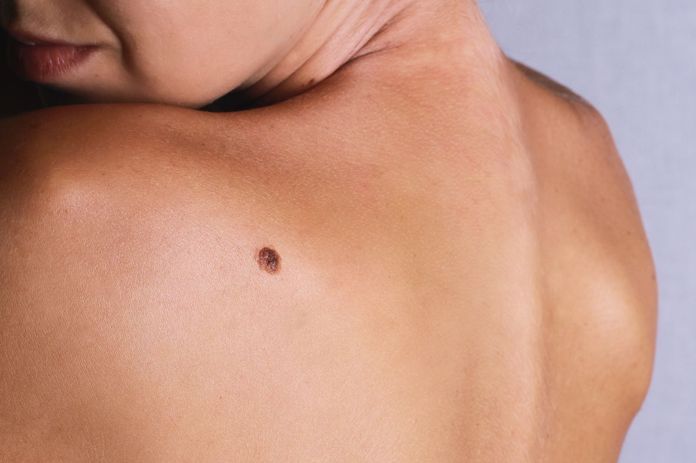 If the mole you have doesn’t match the skin cancer symptoms mentioned above, you might be experiencing normal discomfort linked to some kinds of moles. If this is the case for you, and you prefer to get the itchy mole on chest removed, you can do it safely using 100% natural remedies at home. There are quite a number of ways for mole removal. They work differently to get rid of the raised itchy mole. Some are good at treating while others are meant for deep moles or protruding ones. Surgical technique is one of the most common methods to remove itchy moles. Usually, this technique will be suggested to treat malignant mole where the mole and its underlying skin cells have to be removed wholly. Get the mole examined before to any removal technique. The type of the mole will also decide which technique to undergo. Excision with stitches – the mole and its underlying tissues are cut using a surgical blade. The cut will be made deep into the skin in order to remove the mole completely. This usually will leave a hole, behind which leads to seal with stitches. The size of the hole will totally depend on the size of the mole and how deep of the cell growth. Cauterization – an electronic tool called Cautery is used to burn away the mole. Therefore, no stitches are needed in this technique. In cosmetic mole removal technique, a laser beam is used to fragment the mole cells apart. The heat from the laser will be absorbed by the pigment cells, which causes the breakdown of cells. The body will then absorb these cells during the healing process. This technique is only effective in treating new, flat and small itchy moles on the back, as the laser beam will not reach deep enough into the skin layers. Usually, three to four sessions are needed in order to remove the mole completely and this makes it a costly option for mole removal. This good thing about this technique is that it is not as painful as surgery and scarring is minimal. The natural technique uses herbal products like over the counter cream to disappear the moles. You will have to scrape the mole a bit before applying these natural creams onto the mole to treat them naturally. This will allow the cream to penetrate deep into the skin layer and blast the mole cells. You might notice scab forming in a couple of days. Allow it to fall off naturally, don’t pull it prematurely as this can lead to scar forming. Aftercare is very important following any itchy mole removal procedure regardless which technique you use. In many cases, the healing is quite fast if you take proper care of the wound. Although you must take action in getting help from the doctor. Itchy moles are relatively quicker to treat in 99% of cases and you will face only a little inconvenience and discomfort while getting it removed.